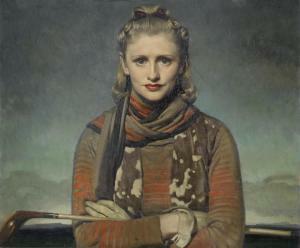 Find artworks, auction results, sale prices and pictures of David Jagger at auctions worldwide. David Jagger R.O.I. 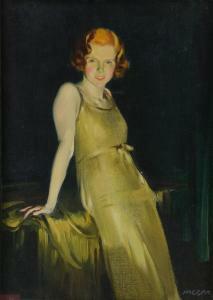 (British, 1891-1958) Portrait of a Young Lady signed twice 'JAGGER' (lower left and upper right) oil on canvas 84.5 x 59cm (33 1/4 x 23 1/4in). Painted circa 1934 Footnotes Provenance Private Collection, U.K. The sitter is thought to be the Artist's wife, Kitty, however there is also a resemblance to the West End and Broadway star Gertrude Lawrence. We are grateful to Timothy Dickson for his assistance in cataloguing this lot. § David Jagger (1891-1958) Study of Girl with red hair I oil on panel, signed, The Art Exhibitions Bureau label, The Art of the Jagger Family Exhibition. No 47. ( The sitter is believed to be the Daughter of Sir William Orpen and Mrs St George) 34cm x 25cm Please note that Artists Resale Right is additionally payable on this lot up to a maximum of 4% on top of the hammer price (visit www.dacs.org.uk for more information)..
David Jagger R.O.I. (British, 1891-1958) The Jade Necklace signed 'Jagger' (upper right) oil on canvas 91.5 x 63.5 cm. (30 x 25 in.) Painted in 1923 Footnotes Provenance Private Collection, U.K. Exhibited London, Royal Academy of Arts, Summer Exhibition, 1923, cat.no.570 Bristol, Royal West of England Academy, Royal West of England Academy 78th Annual Exhibition, 1923, cat.no.115 London, Colnaghi and Clarendon Gallery, Society Portraits, 1850-1939, 1985, cat.no.84 (ill., as Mrs. David Jagger) Literature Financial Times, Glamour of the Society Portrait, 1985 (ill.) A portrait of the artist's wife, Katherine Jagger (1900-1982), known affectionately as 'Kitty'. Kitty Jagger was a strikingly beautiful stage actress, in the press she was often compared to the American actress, Tullulah Bankhead. Intriguingly this portrait was painted at the same time Bankhead made her London stage debut. 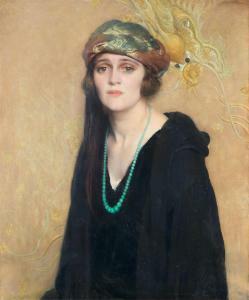 The painting was produced in David Jagger's Oakley Studios in Chelsea and finished shortly before the Royal Academy's submission deadline in the Spring of 1923. 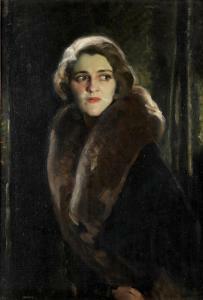 Following their marriage in 1921, David Jagger produced ten exhibition canvases over a two year period of his new wife. 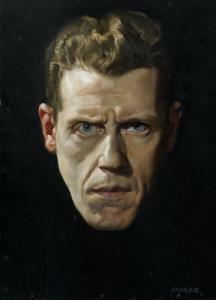 This work being unquestionably one of the finest examples. When the painting was first exhibited at the Royal Academy, it so impressed an American visitor that he tracked her down, only to be disappointed to learn that she was already married. Kitty Jagger epitomised the roaring twenties, with its glamour and excitement. Throughout the decade she was sketched and painted by various artists, including Sir Walter Westley Russell, Keeper of the Royal Academy Schools. Her photogenic beauty led to many images of her appearing in several society magazines, including The Tatler. When this work was included in Society Portraits 1850-1939, the art critic Max Wykes-Joyce noted 'Jagger's Mrs. David Jagger against an oriental wall hanging and Alfred Munnings's My Wife, My Horse and Myself are two of the liveliest paintings in this fine show'. We are grateful to Timothy Dickson for compiling this catalogue entry. Provenance Commissioned by the sitter, thence by family descent to the present owner Private Collection, U.K. Exhibited Sheffield, Mappin Art Gallery, The Art of the Jagger Family, 8 June-6 July 1940, cat.no.37 Sunderland, Public Art Gallery, The Art of the Jagger Family, 24 April-26 May 1940, cat.no.22 Ms. Joyce Rigby (1913-1979), a keen golfer played to Dorset county standard with a handicap of 5. We are grateful to Dr. John Basford for his assistance in cataloguing the present work.